Well I can certainly say this episode delivered an absolutely spectacular showdown. It’s pretty remarkable we get a fight this good after just seeing Uraraka vs Bakugo. Deku brought absolutely everything he had to the table in this one. Probably a good thing they didn’t show Deku’s mother at the end of this episode since she’s probably in a catatonic state after watching all this. Though for the people watching it had to be a beyond spectacular event. If nothing else I think the mission to have Deku announce his presence was a success. It is true that while he can’t control One for All right now, he did push Todoroki really far. 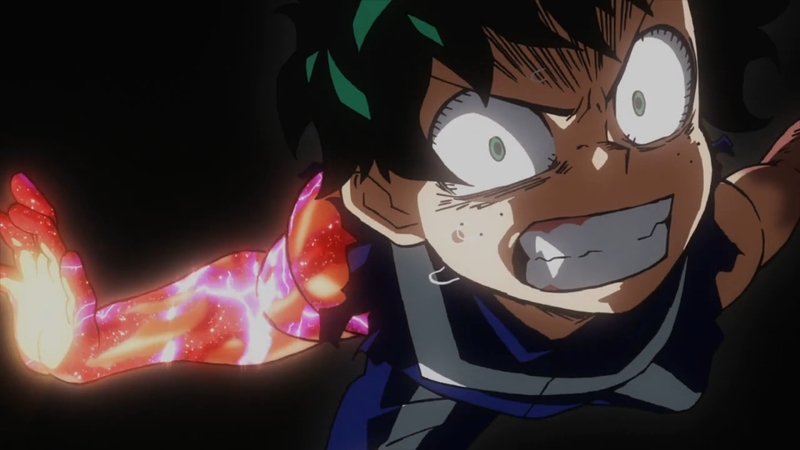 Everyone watching should be able to appreciate the high end potential Deku has. He’s a bit of a project, but at the same time he’s still in school XD. It’s fine to look long term. Full marks to Deku for making Todoroki bring out everything he had. That wasn’t easy and it took a significant amount of self-inflicted damage to pull that off. But it was important. While winning the match was crucial, so was finding a way to save Todoroki. 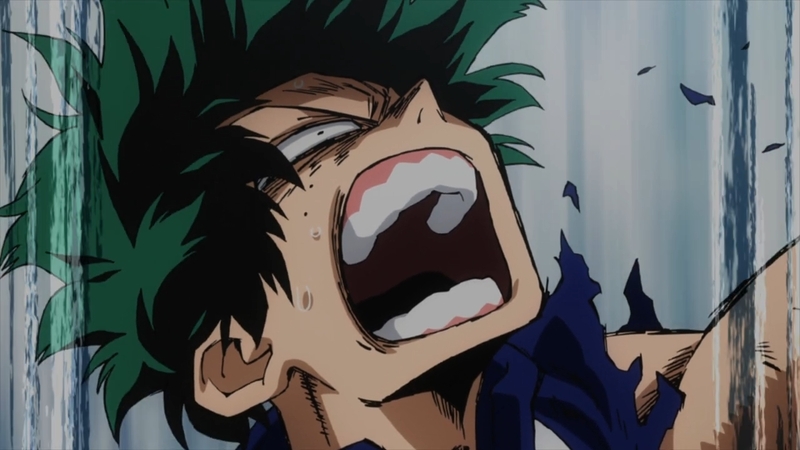 Deku got enough information to realize how tortured his classmate was. And of course I think part of it was Deku not liking the idea of Todoroki just holding back. Not after the fight he just saw from Uraraka and Bakugo, and certainly not when Deku looked on his own dreams. It’s similar to Bakugo in a sense that holding anything back would be insulting to the other party. 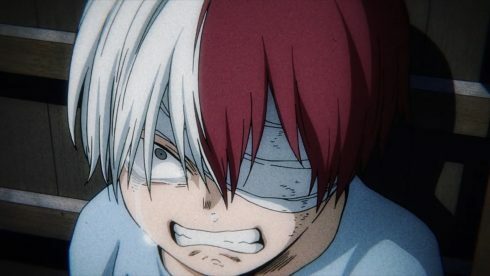 Deku just wanted Todoroki to stop fighting his father and start fighting Deku himself. There is no easy path ahead. Todoroki’s father is a screwed up scumbag. This is someone who physically and mentally abused his wife and children. Frankly he should be in jail himself not the #2 Hero. Sadly it isn’t unusual for people in power to avoid having to take responsibility and for those around them not to see what they are doing. 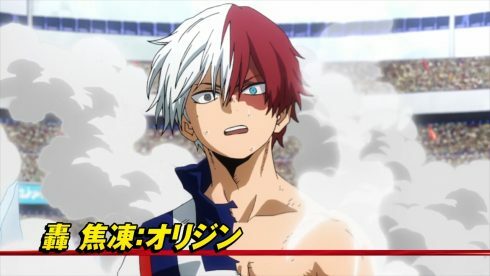 I really hope to see Todoroki stick it to his father somehow. There’s no getting around how messed up that guy is and how he turns Todoroki’s accomplishments into his own. What is important though isn’t denying a power that is part of himself, but taking control over his own life. Not an easy thing for a kid, but that’s just what Todoroki has to do going forward. I did like how All Might remains such an important figure for all these characters. 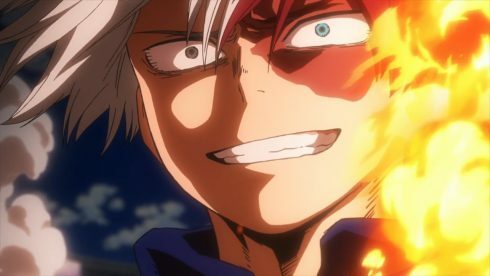 Even Todoroki himself was pulled in by the sparkle that All Might gives off and what he represents. And that does make a lot of sense. In comparison to his abusive father, Todoroki could look at All Might and believe in his words. Of course All Might can make that kind of statement on TV, because his power has nothing to do with his parents. But the point remains the same. He isn’t simply focused on who he inherited One for All from, but accepting it as his power. It isn’t just a power that belongs to those who came before, but something he has to do something with in the here and now. The same goes for Deku. He’ll have to make that power his own. And at least we have a fuller picture of Todoroki’s home life. In a sense it seems like his siblings are blessed. I’d presume from the fact that Todoroki is considered his masterpiece that those kids only had one quirk or the other and maybe some weren’t that strong. But, the positive for them is that they seem able to live their lives with their dirtbag father mostly neglecting them. They aren’t useful tools so he just doesn’t bother much with them. But he still has to do the minimal amount of things. 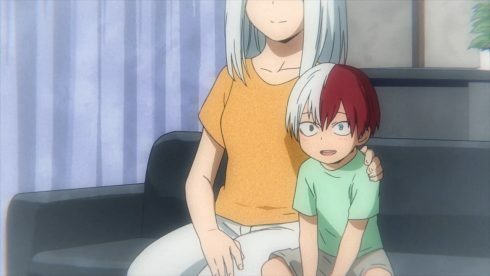 The sad this is with Todoroki’s mother. I’m not going to excuse her actions. Being hospitalized was probably a good move for her own sake. But she is yet another victim of Endeavor’s abuse. She had child after child until the right ‘tool’ was born. Then she watched her youngest be abused for the sake of her husband’s ambitions. What she did was horrible, but I can’t help thinking she and Todoroki are such tragic figures in all this. I just hope that after all this time she’s getting better. The action in this episode was just top notch. Studio Bones really deserves full credit for creating something this darn good. 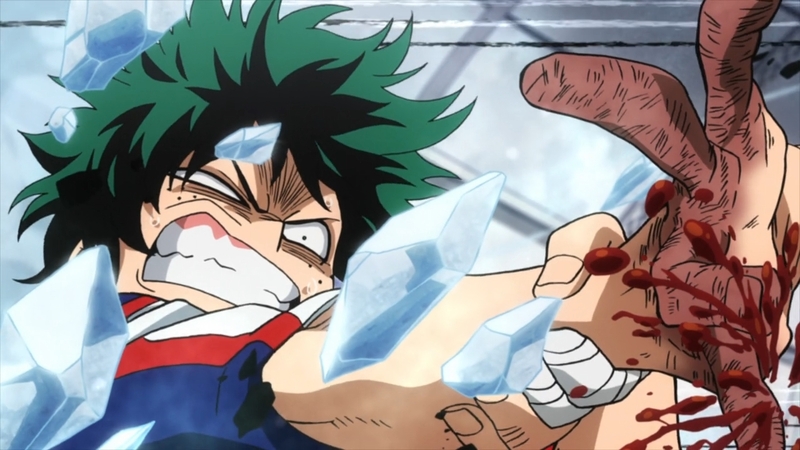 The clash between Deku’s smashes and Todoroki’s ice (and eventually fire) was pretty darn fun to watch. Deku’s desperation to not let Todoroki get too close too quickly was apparent. You could just feel the damage he was taking in that fight and the pain he was fighting through. Yes, he’ll need to get to the point where he isn’t relying on Recovery Girl’s power to bounce back, but right now this was the best he could do. The final big attack was something amazing. Even Cementos had to get involved to make sure they didn’t annihilate each other with those big attacks. I also really appreciate how they still take time to show pros and cons for quirks. Bakugo making the point that these are physical abilities. There is physical strain in their use and things to watch out for. 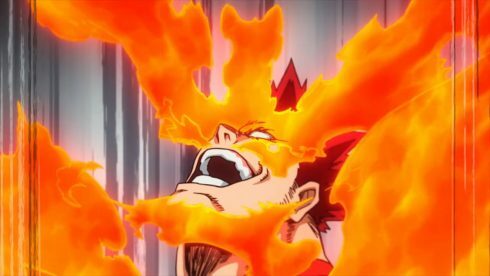 Bakugo himself clearly pushed right to his limit in countering Uraraka’s move last episode. If it was any more than that then he might have seriously hurt himself. These powers can’t just be blasted around without thinking, though certainly his quirk is powerful. Todoroki as well had to deal with the weak points of his quirk. Though what makes Endeavor a scumbag genius is that combining those two quirks is insanely useful. 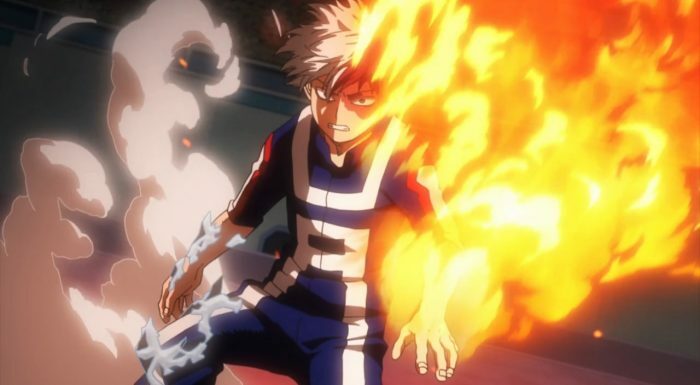 Todoroki can use his left side to warm himself up and thus keep using massive ice moves that normally would start impacting him like they did in this match. Same probably goes for the reverse. In the end this was a spectacular episode. Another one of the very best we’ve gotten this season and it will be hard for any other matches to top this. It is too bad for Deku that he’s done, but he did well enough. He made his mark on this event and now he needs to focus on recovery. Long term this match will mean a lot for Todoroki’s growth as a person. I think one can say that their rivalry can really begin here and now. They’ve both acknowledged each other and thrown everything they had into this match. Todoroki gets the win for now, but if he wants to win long term then he’s got to learn to use everything he has. At least Deku can say one thing proudly. When things got tough near the end of the match, he was able to smile.